Now I’m not a baby, but I can imagine it would be really cool if my parents just knew it was diaper changing time without me crying about it and disturbing everyone within a thirty-mile radius. A team at Ritsumeikan University in Japan gets it—they’re working on a urine-powered diaper sensor that can tell when it’s time for a changing. The team has been working on the diaper for quite a few years now, with the actual inspiring goal of caring for aging patients suffering from urinary incontinence. Producing a diaper-worthy sensor has been a challenge, however. The scientists first developed a urine sensor too rigid to embed into a diaper. They pushed forward, developing the flexible embeddable battery and sensor they needed... but those batteries contained a chemical potentially unsafe for humans, and their charging times varied. The most recent diaper sensors, published last year in the IEEE Sensors Journal, overcome all of those problems. The sensor’s most important part is its urine-activated battery. Batteries operate based on the function of two electrodes separated by an electrolyte. While the paper doesn’t explicitly say this, based on all the diagrams, I would assume the urine acts as the electrolyte allowing current to flow between either of the two electrodes. 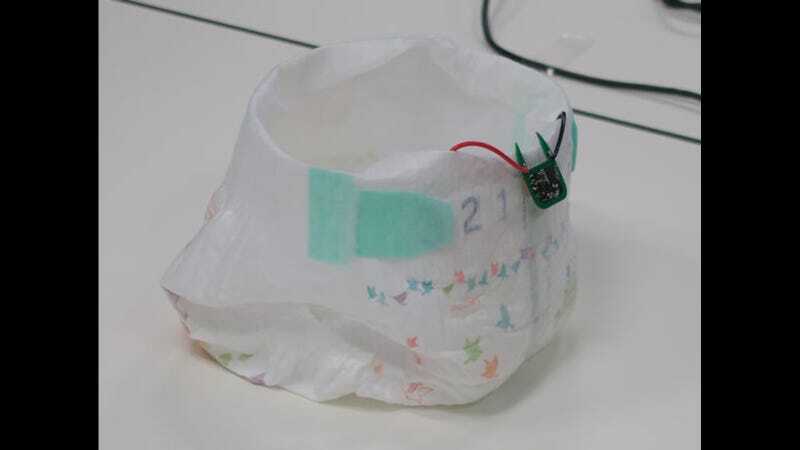 The scientists embedded two flexible electrodes into a disposable diaper for their tests. The battery attaches to a tiny capacitor for storing the generated electricity, and a transmitter which can beam its signal to a receiver up to 16 feet away. The team tested the battery and those tests worked, but the paper conveniently leaves out where all of the urine came from. Next up, they’ll do some field tests on real people. The paper does point out that the battery generates less than 100 microwatts of power, so it wouldn’t electrocute the poor wearer’s crotch. There’s plenty of other interesting diaper tech out there. Another Japanese team created their own disposable sensor back in 2014, and Gizmodo covered a similar QR-code based disposable diaper pad that can check for urinary tract infections. But those superdiaps don’t turn the wearer’s entire nether region into a battery. The diaper inserts aren’t on the market yet, but I will leave you with this piece of prose from the Ritsumeikan University website about Tanaka Ami, who works with the diapies. Pretty much everyone keeps their distance if told they will have to work with urine, but her curiosity would simply not allow for that. There are electrolytes within our urine. Realizing this fact, she drew a blueprint for diapers that send a signal when someone has urinated in them. However, even though electricity was generated, it was not even 1/100th of the required amount. With no previous examples to work from, failures were a given. But after hundreds of tests, electricity was stored in the condenser, and a new system for generating power was born. For the first time a batteryless, wireless, system that could alert caregivers from a distance of wet diapers was developed. And although it took over 5 years, it should only take a little longer to make this a real commercial product. She says that “by solving these daily problems. I feel the world will get a little better.” By the year 2050 one in three Japanese will be over the age of 65. Her[sic] curiosity has illuminated the future of our super aging society.